Owned by a pair of Danish twins, the Copenhagen Coffee Lab imports all its coffee from the micro-roastery of the same name in Copenhagen. While it might not be home-grown, the coffee offering is certainly impressive. There’s a pair of single-origins on espresso, tailored to specific drinks, with three more on filter, through V60, Aeropress or cafetiere. 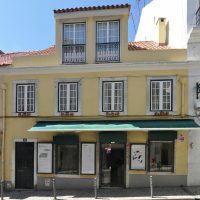 The coffee shop itself occupies a lovely, cool, low-ceilinged spot, ideal for Lisbon’s warm, southern climate. The atmosphere’s relaxed, with plenty of seating options, including in the windows flanking the door, ideal for people-watching. Finally, a small, windowless room right at the back lets you get away from it all if you want. Copenhagen Coffee Lab is on the northern side of Rua Nova da Piedade, to the west of the city centre. Be warned though; Lisbon’s very hilly, so be prepared for a few ups and downs on the way there! The south-facing façade catches the sun, so the awning which provides shade to the windows either side of the glass door is essential. There’s a step down to the floor of the coffee shop, with small windows inset into the thick, stone walls either side of the central door. Despite their relative lack of size, it’s bright inside, helped by the white-painted walls/ceiling, which, coupled with the tiled floor, all add to the coolness (temperature that is). The layout’s simple, but effective, the low-ceilinged space stretching away ahead of you. There’s a sit-in window-seat to the left, with a more traditional window-bar with stools to the right. The L-shaped counter’s on the left-hand side, six bar-stools safely tucked under the projecting counter-top on the short side, which faces the window. The counter’s business-end faces into the room, the till nestling between the cakes (left) and the filter station (right). A small, enclosed kitchen area is tucked away beyond the counter. The remaining seating’s on the right-hand side. There’s an eight-person communal table against a bench running along the wall, then a cluster of four small, square tables. Two are against another, shorter, bench, while the remaining two are free-standing, seating provided by stools. Beyond the tables, a rack of retail kit stands against the wall, plus there are beans for sale on shelves to the right of the door. Finally, through an opening on the right-hand side of the back wall, a step leads up to a cosy, window-less room which houses two more tables. The beans change every couple of weeks, when the new shipment arrives from Denmark. During my visit, there was a Brazilian single-origin, which was used for espresso, flat whites and larger milky drinks, while a Guatemalan single-origin went into cortados and macchiatos. I tried the Brazilian espresso and was rewarded with a really short shot, which, despite a little bit of acidity, was very well-balanced, going down really smoothly. All the cakes/pastries are baked by the staff. Like the coffee, there’s a Scandinavian influence at play, although the staff are very multi-national. My barista (one of the bakers) is from Northern Germany, while there are two more bakers, one Danish and one Portuguese. I settled on a cinnamon swirl bun concoction to accompany my espresso: thick, chewy pastry wrapped around and sprinkled with a rich, but not sickly, cinnamon sugar. A fine choice, even if I say so myself. I followed this up with a Kenyan single-origin through the V60. This too was very fine, a bright and fruity coffee, typical of what I’ve come to expect from a Kenyan. It was served in a carafe with a cup on the side, although I expected nothing less. Although the coffee is mostly hand-poured, an automated filter machine is occasionally used during busy weekends. While I was there, there were very few Portuguese customers, something my barista confirmed was the case more generally. She admitted that it was hard work converting the locals to speciality coffee, although they are slowly getting there, particularly amongst the younger crowd. December 2016: Copenhagen Coffee Lab, Lisbon was a runner-up for the 2016 Best Overseas Coffee Spot Award. You can also see what I made of the original Copenhagen Coffee Lab when I visited it in Copenhagen six weeks later. This entry was posted in Breakfast, Cafe/Roaster, Cafes, Cake, Evening Opening, Laptop Friendly, Lisbon, Retailers, Sandwiches and tagged include by Brian Williams. Bookmark the permalink.